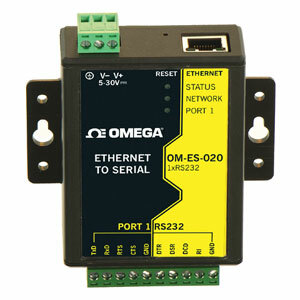 The OM-ES-020 ethernet to serial device server is ideal for industrial applications. Data transfer rates up to 1,000,000 baud, coupled with 1Mbit/s line drivers deliver uncompromising performance. The OM-ES-020 range provides simple instant networked serial ports. A web interface allows secure configuration and control of the serial ports over a local network or the internet using any browser. For Windows® our 32- and 64-bit driver gives you local COM ports, retaining existing software applications and allowing you to connect across your network to remote devices just as if they were attached locally. You can access the device via TCP/IP sockets from any networked device like an Android tablet, PC or phone. Serial port tunneling (individually configurable) allows serial cable replacement over any distance, no software required. On Windows OS TCP/IP sockets are handled by the Winsock API, this will differ on other OSs. The OM-ES-020 can be wired into existing power and network infrastructure or it can be used with a separate power supply. Windows Users Our software drivers give you local COM ports, allowing you to retain your existing software applications and connect to your devices over the network. COM Port can be assigned from COM1 to COM255 and the OM-ES-020 ethernet to serial device remembers your COM Port assignment on reboots. Alternatively access the device via TCP/IP socket from any networked device. Configure options via web interface. Note: Android is a trademark of Google, Inc. Windows, Windows Vista, and Windows Server are registered trademarks or trademarks of Microsoft Corporation in the United States and/or other countries. Linux® is a registered trademark of Linus Torvalds in the U.S. and other countries. Note: Comes complete with utility software and operator’s manual on CD.